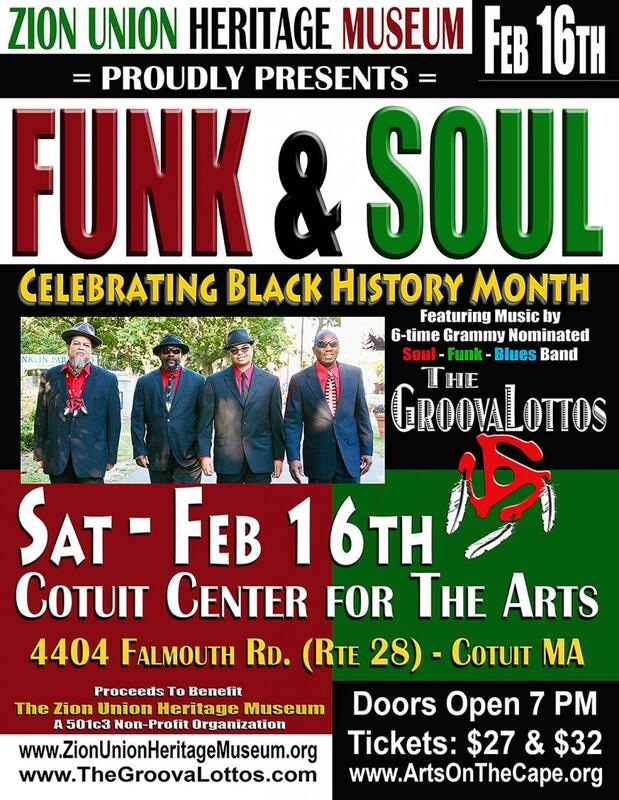 COTUIT - "FUNK & SOUL" is a special concert in honor of Black History Month that is being presented by the Zion Union Heritage Museum at the Cotuit Center for the Arts in honor of Black History Month. "FUNK & SOUL" is taking place on Saturday, February 16 at the Cotuit Center for the Arts, 4404 Falmouth Rd (Rte 28), Cotuit, MA. Doors open at 7pm for a 7:30 start. Featuring 6-time Grammy nominees, The GroovaLottos, this special concert/party is a fundraiser for the Zion Union Heritage Museum, a museum that celebrates the African-American, Cape Verdean and Wampanoag populations as well as the ethnic and demographic diversity of Cape Cod. The Zion Union Heritage Museum was founded in part by the Community Preservation Act and the Lyndon Paul Lorusso Foundation in partnership with the Town of Barnstable. The Museum will be recognized not only as a historical landmark in the Commonwealth but a national historic landmark as well.